Tens of thousands of people in South Sudan have died and roughly one in three people have been forced from their homes since the renewed conflict broke out in 2013. Two million people have fled to neighbouring countries, while another two million are displaced within South Sudan. Security also remained a major challenge for humanitarians in 2017, as their facilities came under attack and it became increasingly dangerous to work in some areas. MSF operates primary and secondary healthcare programmes in hospitals and clinics, runs outreach activities for displaced people and remote communities, responds to emergencies and outbreaks as they occur and carries out preventive activities such as vaccination campaigns. In 2017, MSF carried out an emergency nutritional intervention in response to reports of high levels of malnutrition in Mayendit and Leer counties, which have been plagued by years of violent conflict. MSF also set up a system in which South Sudanese staff travel with displaced people to provide medical care, including for victims of sexual violence. MSF continued to provide primary and secondary healthcare in Lankien, including treatment for kala azar (visceral leishmaniasis), despite fighting that forced staff to evacuate several times and civilians to escape into the bush. The team also responded to a cholera outbreak, setting up a treatment centre in Lankien and oral rehydration points in three surrounding areas. In Fangak, a remote opposition-held area, MSF manages the emergency room, operating theatre and inpatient feeding centre, as well as the paediatric, adult and maternity wards at Old Fangak hospital. In 2017, teams also opened an outpatient clinic in nearby Phom, and deployed mobile clinics along the Zeraf River. A MSF speedboat re-embarks the mobile clinic team after a day further north in the village of Diehl. In Pibor, MSF continues to be the sole provider of medical services to the Murle people, operating through one primary healthcare centre and two primary healthcare units in Lekongole and Gumruk. At their peak, malnutrition rates amongst our patients were three times higher in 2017 than in the previous year. MSF’s clinic in Pibor was attacked twice in 2017, forcing the team to suspend activities temporarily. Violent clashes also resulted in the closure of two MSF projects in Upper Nile state. In late January, fighting between government and opposition forces in Wau Shilluk forced people, including MSF staff, to flee. The MSF hospital was subsequently looted and destroyed and the team evacuated to Kodok, where they continued to provide healthcare to those who had been displaced. In April, Kodok was also attacked, and staff and patients fled with the local population to Aburoc. Here, the team set up a field hospital, responded to a cholera outbreak in the makeshift camp, and supported remote communities with decentralised care. 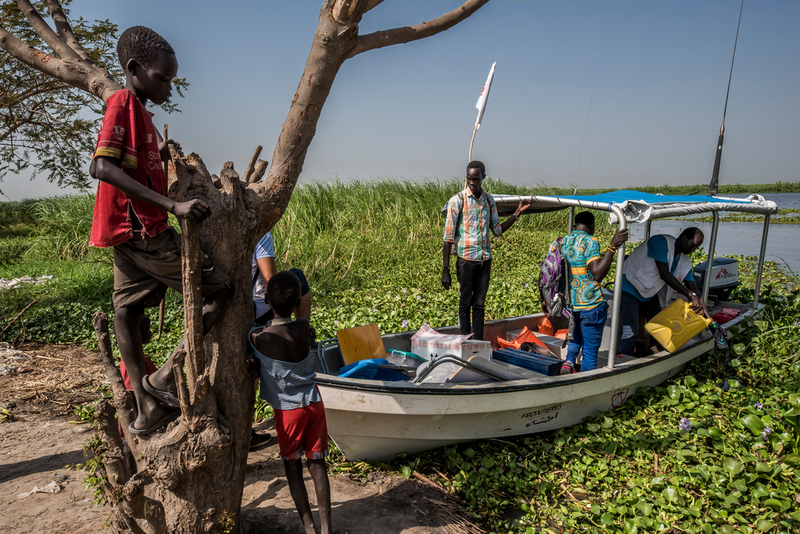 Towards the end of 2017, following fighting that led to further displacement, MSF started running clinics on boats to serve people in isolated villages along the Akobo and Pibor rivers, where there are few health facilities. MSF continues to develop its decentralised model of primary healthcare in order to reach as many people in these scattered communities as possible. MSF continued to run a clinic in Mayom town in collaboration with the Ministry of Health, offering basic primary and emergency healthcare, as well as treatment for HIV and tuberculosis (TB). MSF continues to provide medical care within UN PoC sites, which were set up as a temporary solution to protect people trying to escape the violence in December 2013. Four years on, hundreds of thousands remain trapped in a hostile and insalubrious environment where living conditions are well below acceptable standards. Dr. Mustafa Alajeeli examines a patient during a mobile clinic in the village of Diehl. Secondary healthcare, surgical services and support for victims of sexual violence is available in MSF’s 160-bed hospital in Bentiu, the country’s largest PoC site, which has a population of more than 110,000. In Malakal PoC, which is home to around 25,000 people, MSF provides secondary healthcare and mental health services. MSF also runs a hospital in Malakal town and has started to provide care for remote communities in the surrounding area. In mid-2016, the Equatoria region emerged as a new frontline in the conflict, and hundreds of thousands of people were uprooted by the surge in violence. Security challenges prevented MSF from gaining full access to respond to the immense humanitarian needs of the displaced, especially around urban centres where there was intense fighting between government and opposition forces. 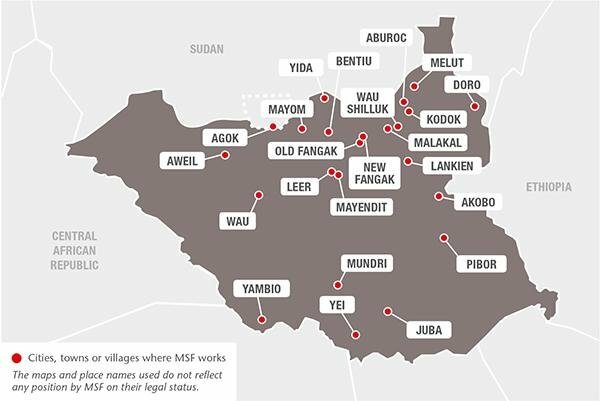 In addition, MSF staff in Yei were arrested by South Sudanese army forces while on duty on 4 January; two were released on 27 January and the other four on 31 March. This incident raised serious concerns as those involved were working hard to bring lifesaving healthcare to people in need. MSF, however, remains committed to its work in the area. The team in Yei offers basic healthcare in two clinics within the city. In Mundri, the primary healthcare team focuses on maternal and child health, as well as community-based care for victims of sexual violence. In Yambio, the team continues to run its established HIV ‘test and treat’ programme and mobile clinics for displaced people. In March, MSF closed the mobile clinics it had been operating in Wau and the surrounding countryside as other organisations began medical activities in this conflict-affected area. MSF staff manage the paediatric and maternity departments in Aweil state hospital, where malaria remains the main cause of admission. Teams also support five health facilities with testing and treatment for the disease throughout the rainy season. In Agok, MSF runs the only referral hospital in the area providing primary and secondary healthcare, including surgery for a population of more than 140,000 people. Due to the increased need for specialist healthcare, MSF started to rehabilitate and extend the hospital in 2017. The new inpatient department, due to be completed in mid-2018, will provide room for more than 140 patients. MSF continues to work in camps for Sudanese refugees. In Yida, teams manage an inpatient department, an inpatient feeding centre, a neonatal unit and the treatment of HIV and TB. In Doro, MSF built a new hospital which has improved patient care and infection control. The team also carried out a mass vaccination campaign and spraying activities to reduce the incidence of malaria. In addition, MSF provided outpatient care and vaccinations to 21,000 South Sudanese living in nearby Maban, and extended its vaccination activities into nearby opposition-held areas. 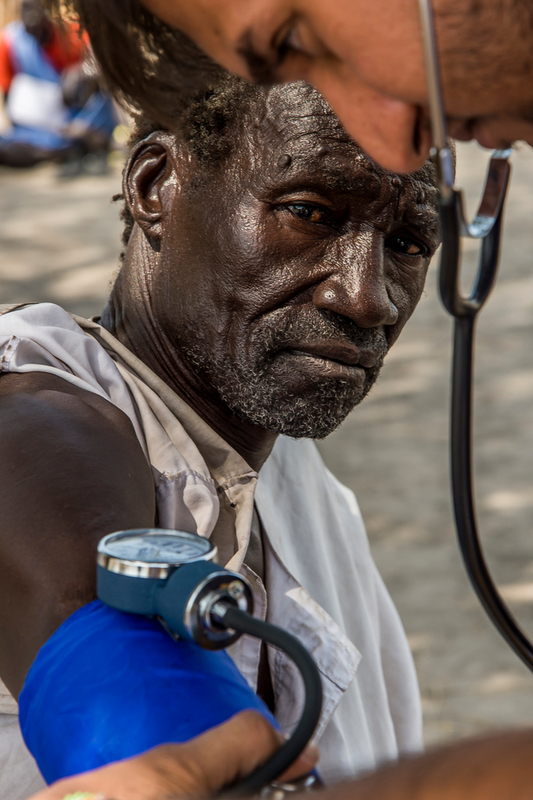 Our clinic in Pibor provides inpatient and outpatient care, including emergency services. Looting in February temporarily halted activities, but the clinic was fully operational once more by April. Towards the end of the year, we started offering surgery.